I&apos;ve been running some sort of a Linux distro as my main OS for over a decade. However that has changed over past 6 months as I&apos;ve switched to OS X and, while initially I&apos;ve struggled, I now quite enjoy using it and will probably stick with it for a while. One of the main things that attracted me to OS X is a great hardware that other manufacturers still struggle to match. I&apos;ve attempted to run Linux on a MacBook Pro before but that turned out to be impractical. Few years later I&apos;ve decided to bite the bullet and start using OS X, here&apos;s my opinionated guide to replace/disable/change features of OS X that I&apos;ve found annoying and install/enable ones that are more familiar to me as a long-time Linux user. OS X comes with no packaging system of it&apos;s own, albeit for the App Store, which doesn&apos;t count in my opinion. There are however at least two well-known solutions for that: MacPorts and Homebrew, if you ask me I would go with the latter. There&apos;s an easy one-liner to install it and afterwards you can use it from command line similarly to how you would use apt-get/pacman/emerge etc. Here&apos;s piece of documentation that I used as a crash course on brew. Arguably Apple makes the shittiest mouses and the best touchpads. In fact, touchpads they make are so good that they&apos;ve made a standalone version and I would choose that over the "magic" mouse every time. However the default config for a touchpad on MPB is crap. 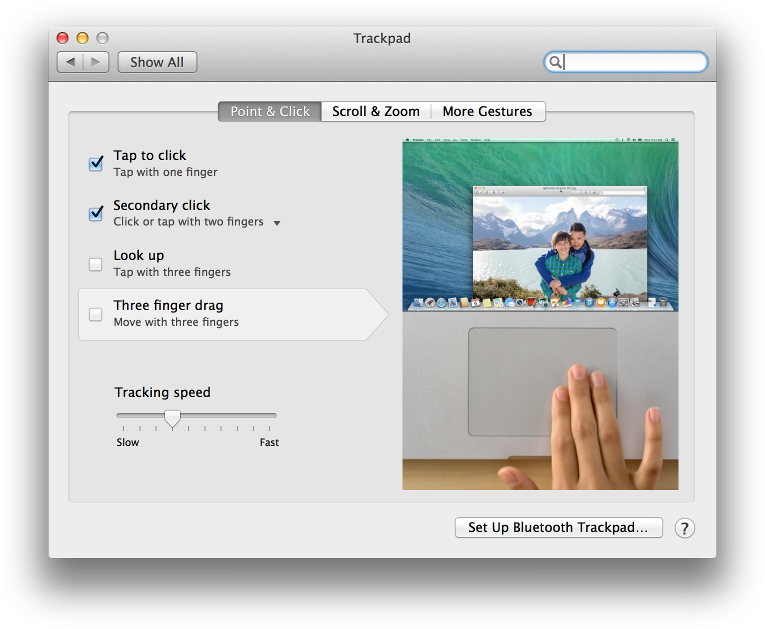 Half of the gestures are pointless and how on earth do I make a middle click with this?! I mean WTF, how are OS X users supposed to open links in a new tab or close the existing tabs? And why Apple opted to have absolutely no support for such a basic feature? Luckily one brave Clément Beffa delivers where Apple fails, here is a little, open source app that enables middle click tap on OS X. Install it either with brew or directly and place it in login autostart configurable from preferences -> users & groups -> Login items [tab]. I run everything with a luncher by typing first few letters of what I want - I find this much faster and less distracting than fiddling with taskbars/quicklunchers/desktop icons or dreadful start menus. OS X comes with it&apos;s own luncher called Spotlight and accessed with ⌘ + space key combination. Spotlight is not too bad but there&apos;s a better alternative: Alfred capable of extra features such as file & web search, built-in calculator etc. I&apos;m using it instead of Spotlight, you need to tweak the keyboard shortcuts for that. Bye dock, was nice seeing you... not! iTerm 2 is a highly customisable terminal replacement for OS X and it comes with some pretty awesome features. Any Linux user will feel at home, while you at it, why not add few extra features to the shell itself? There are three things to do here, all within Preferences -> Keyboard. Firstly I switch the default behaviour of the fn so that F1, F2 etc. behave as standard function key - you can still use special keys such as volume up/down using a fn modifier key. Secondly disable some annoying keyboard shortcuts that may conflict with shortcuts you use elsewhere, e.g. Control + Shift + ↓ is used in Sublime Text for multi-line selection, however because it&apos;s also specified as a global shortcut (under mission control), Sublime Text will never receive that key combination. Finally on Shortucts tab, enable Full Keyboard Access by selecting All controls - enabling this allows for tabbing in dialogs and selecting answer using space. One more thing that you might find annoying is using ⌘ in common key combinations like copy/pasting, instead of the Control key used commonly in Linux and Windows. This however has multiple advantages and totally makes sense in the long run. Firstly more central ⌘ key placement on the keyboard means you can press it in conjunction with more letter keys on the keyboard. Secondly your shortcuts don&apos;t conflict with your terminal signals (e.g. you can use ⌘ + C in terminal for coping text and still use Control + C for sending SIGINT). ⌘ + Shift + 4 Take a screenshot of a selected region and save it to the desktop. Alternatively instead of selecting a region, press Space and then application window to take a screenshot of that app. Enter to rename file/folder. Weird. Space to get a quick preview of a file. Gives folder summary including size on folders. BTW: there&apos;s no ⌘ + X in Finder... go figure. Also explains helps you see how your OS is spreading these annoying .DS_Store just about everywhere. Apps running in Xquartz will not recognize keyboard shortcuts with ⌘ key, use Control instead. Some apps tend to misbehave slightly, e.g. Inkscape will occasionally just not start. With all the customisations and extra layers of software installed you need to be very careful with updates. Make sure that productivity software you&apos;ve installed (Slate, Alfred, middleclick, XQuartz) is actually going to work after you update to the next major version (major in this context being 10.9 to 10.10). I hope you found my subjective guide or at least some parts of it useful. I invite you to share your own migration tips in the comments section below.